Heirloom styling with antique accents make the Memory Edition pet urns truly special. Polished brass touches, a glossy veneer and black felt panels provide traditional appeal with a sophisticated flair. Choose a pet urn designed to hold your pet's cremains or an urn with compartments for memories as well. A handsome resting place for your pet. These wood pet urns are crafted from rosewood veneers giving them a rich, warm appearance. Interior felt-covered panels offer high-end detail. 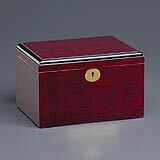 Like the Memory Urn, the Memory Box offers a beautiful and dignified resting place for your pet's cremains. 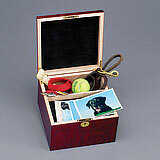 The Memory Box pet urns also provide compartments for keeping your pet's toys, collar or other remembrances close.